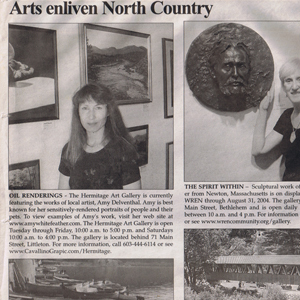 OIL RENDERINGS – The Hermitage Art Gallery is currently featuring the works of local artist, Amy Delventhal. Amy is best known for her sensitively rendered portraits of people and their pets. To view examples of Amy’s work, visit her website. Ther Hermitage Gallery is open Tuesday through Friday 10am to 5pm and Saturdays 10 am to 4pm. This year’s show is looking to be one of the largest ever according to the Littleton Area Chamber of Commerce. The show takes place on Saturday, September 25th on upper and lower levels of Mill Street as well as across the river on Riverglen Lane connected by the new wooden pedestrian bridge. Music, sponsored by Laconia Savings Bank, will be enjoyed throughout the day. Littleton Grist Mill is the major sponsor of the 25th Art Show.